Notes: The London & North Western Railway opened Aspley Guise station in 1905 to cater for the new rail-motor service between Bletchley and Bedford which was inaugurated on 1 December 1905; it was one of seven new halts. The exact opening date is unclear. One LNWR record states that the 'rail motor-car has been operating between Bletchley and Bedford since 30 October'. Railway Magazine (December 1905) reports that the service was planned to start on 1 November and was delayed at the last minute because of its unreliability, and a 1 December re-start is mentioned. Other contemporary documents and publications are contradictory. 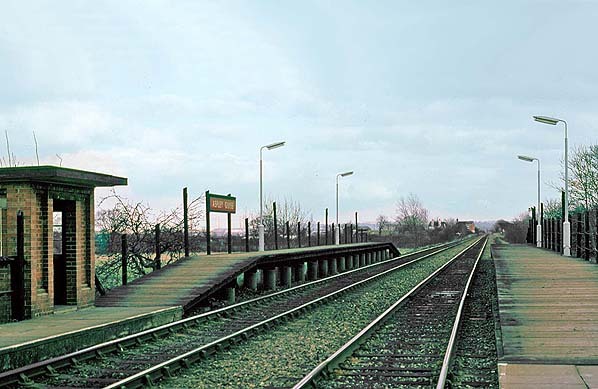 As built, Aspley Guise was very basic with a 50ft low platform constructed of old sleepers at rail level with a nameboard and one oil lamp but no shelter. The rail-motors were fitted with folding steps for passengers boarding or alighting at Aspley Guise and the other halts. The crossing keeper was provided with a wooden hut sited between the down platform and the crossing. There were no signals, and the gates were left across the road. There was a bell beside the gates so that anyone travelling along the road could summon the crossing keeper who lived in the adjacent cottage; this arrangement pre-dated the halt. The gate keeper’s cottage was built in a similar architectural style to station buildings within the Woburn estate. 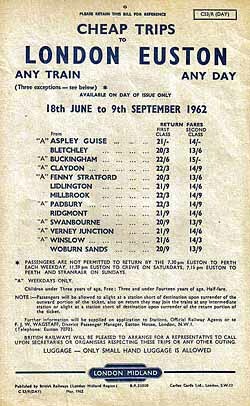 Along with the other rail-motor halts on the Bedford - Bletchley line, during WW1 Aspley Guise closed on 1 January 1917 as an economy measure; it reopened on 5 May 1919. During LMS days the wooden sleepers of the original platform were replaced with concrete paving. The LMS also provided a brick waiting shelter with a flat concrete roof on the down platform. With the introduction of DMUs in 1959 the original platforms were replaced with longer platforms of conventional height, but still timber-built. A section of the original down platform with the waiting room was retained. Aspley Guise lost its gate keeper and gated level crossing to modernisation in 2004, and since then the station has been unmanned, but there are two security cameras operated from other stations. In 2004 the down platform was demolished and a new platform built on the other side of the level crossing. By having staggered platforms road traffic on the level crossing is not held up by trains standing still in the platform before proceeding over the crossing. A number of halts on the line had their platforms staggered as part of the Bedford-Bletchley route modernisation. Aspley Guise station, in common with others on the Marston Vale Line, is covered by the Marston Vale Community Rail Partnership, which aims to increase use of the line by involving local people. Services are operated using a Class 153 single-car diesel multiple unit and 2-car class 150 unit. In May 2013 the Friends of Aspley Guise Station Adoption Group was formed in conjunction with the community rail partnership. The group consists of committed volunteers from the local area. They have already been hard at work, and regularly monitor the station to ensure that everything is up-to-scratch and report any damage seen at the station. They are still at an early stage but have some big plans for the future. Aspley Guise halt looking west c1906, a few months after the motor station opened. As built there were two short, low platforms built from old sleepers laid at rail level. Each platform had a nameboard and a single oil lamp but at that time no shelters were provided. The crossing keeper's cottage, which was built in a similar architectural style to other railway buildings within the Woburn estate, and the crossing keeper's hut predate the halt. 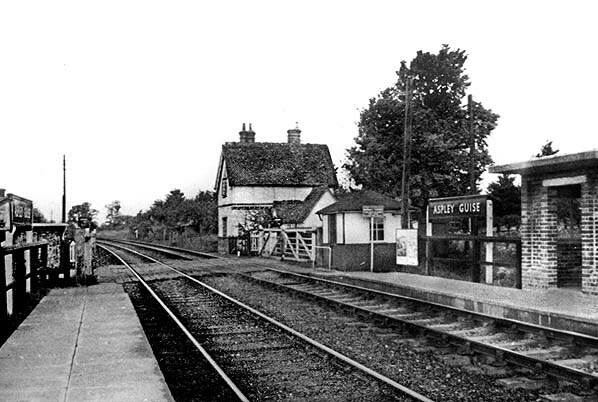 1883 1:2,500 OS map shows the level crossing 18 years before Aspley Guise motor station opened. The crossing keeper's cottage and the hut on the opposite side of the level crossing are both shown. 1963 1:2,500 OS map shows the station after the platforms were rebuilt and lengthened. The waiting shelter built by the LMS is shown at the west end of the down platform. There has been considerable residential development to the south of the line as the village has grown. 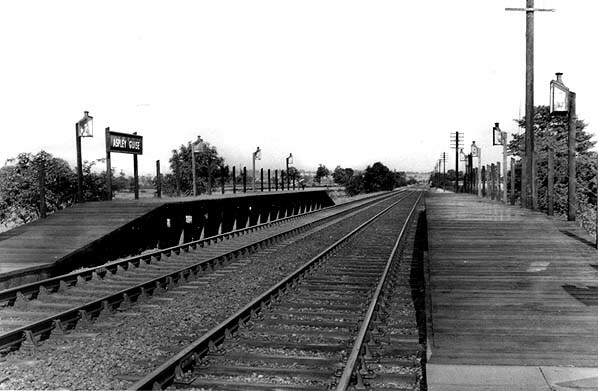 Aspley Guise station looking west from the up platform in 1953. The platforms were rebuilt by the LMS with concrete paving slabs, but they are still low,with steps being required to by passengers boarding or disembarking from the push-and-pull trains that replaced the rail-motors. These continued to provide the service until DMUs were introduced in 1959. The LMS also provided a brick shelter on the down platform. Note the two BR London Midland Region running-in boards. 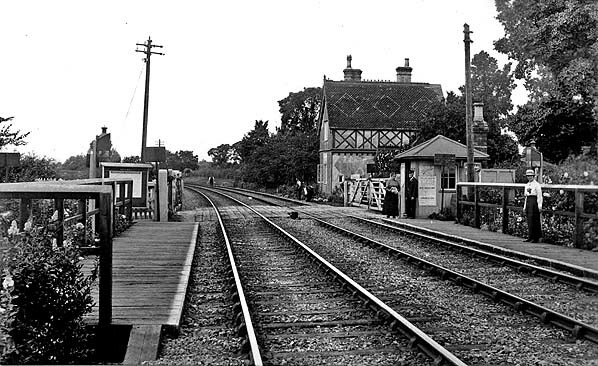 Aspley Guise station looking east from the level crossing c early 1960s. New platforms have been built for the DMUs that took over the service in 1959. Facilities are still very basic with a single running-in board and four oil lamps on each platform. 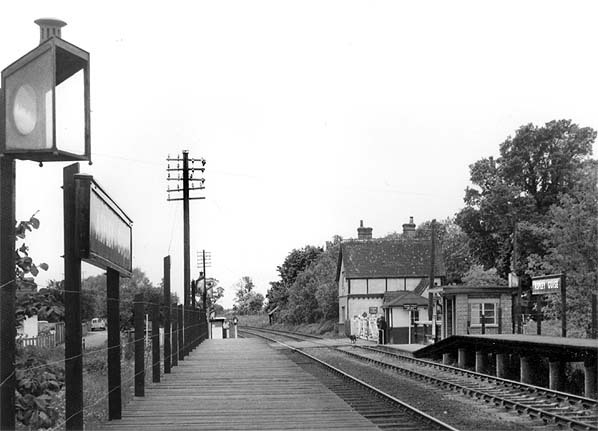 Aspley Guise up platform seen from a Cambridge-bound DMU in December 1967, a week before closure of the Oxford - Bletchley and Bedford - Cambridge lines. From the New Year only the middle section between Bletchley and Bedford St Johns would remain open. 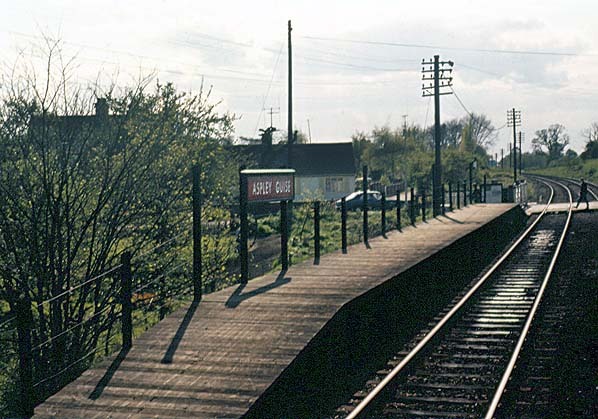 Aspley Guise station looking west from the up platform c late 1960s. The gate keeper's cottage has lost some of the decoration seen in the 1906 picture above. 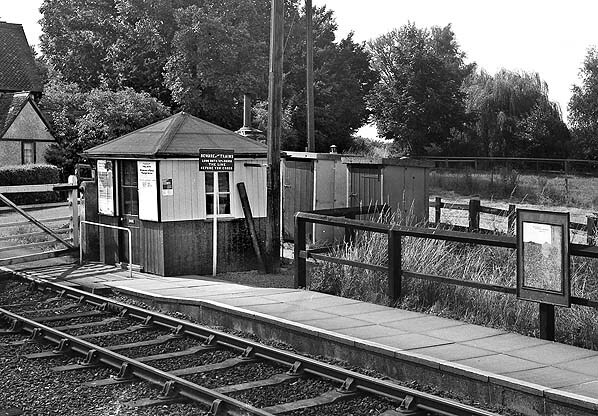 When the new platforms were built in 1959 the west end of the old down platform was retained to avoid having to rebuild or replace the brick waiting shelter, which is still in use today. 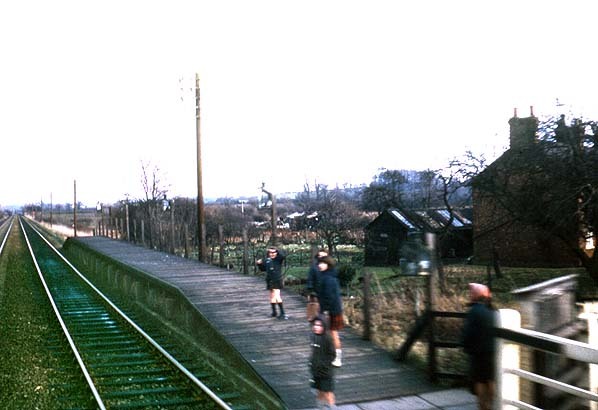 The retained low section of the Aspley Guise down platform c late 1960s. Public access to the platform was behind the crossing keeper's hut. 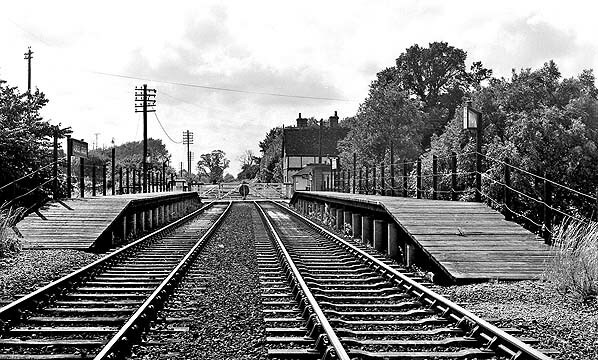 Aspley Guise station looking west c late 1960s. The two platforms are slightly staggered to accommodate the length of original down platform that was retained. 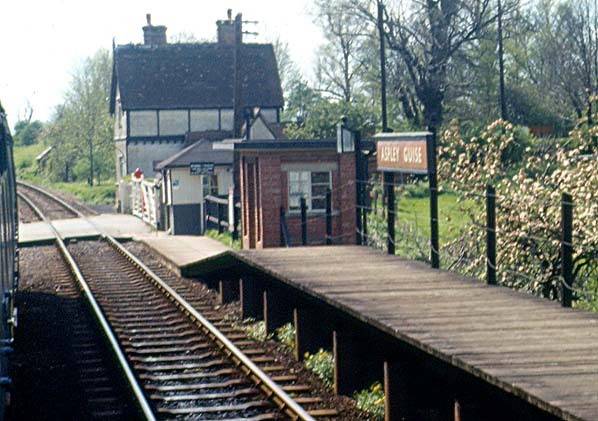 Looking west from Aspley Guise up platform in May 1970. The platforms were well lit by four evenly spaced oil lamps. 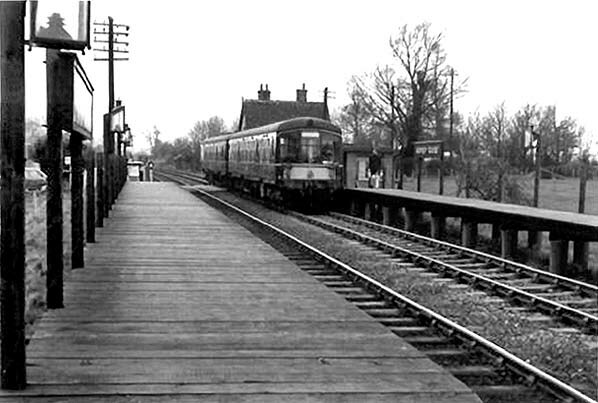 Aspley Guise station’s down platform seen from a Bletchley-bound DMU in May 1973. 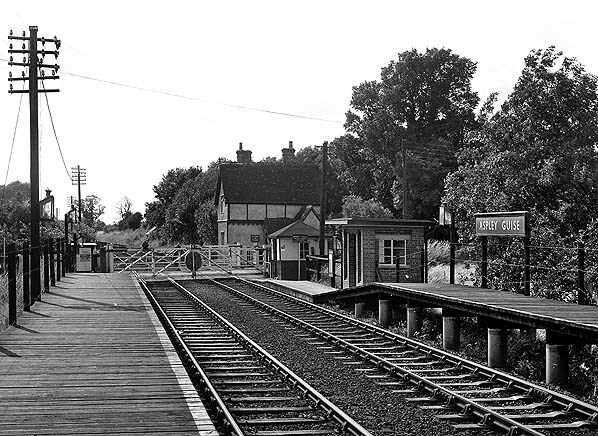 Looking west at Aspley Guise station’s up platform from a Bedford-bound DMU in May 1973. Aspley Guise station looking east from the level crossing in February 1977. The LMS waiting room stands on the original low platform. A much shorter section of the earlier up platform has also been retained. The four oil lamps have been replaced with two taller electric lights. Within two years the BR running-in boards would also be replaced as part of British Rail's Corporate Identity policy. The gate keeper's cottage for the Berry Lane crossing is seen in the distance.